John Home’s Douglas is not much known nowadays, but for over 100 years after its first performance in Edinburgh in 1756 it was a standard repertory piece in the theatre. The play’s impact in Scotland when it debuted was tremendous and made Home a household name. Supporters compared him to Shakespeare and patriotically touted Douglas as an example of Scottish drama that could stand aside the greatest works of Classical drama. Opponents mocked these hyperbolic claims and, outraged that a minister of the Kirk should have written a play, were more likely to compare Home to Satan. The pamphlet war that ensued produced a plethora of attacks and defences of Home and his play. These ranged from learned disquisitions on the value of the theatre to satirical mock ballads and scurrilous lampoons. On the back of this controversy, Douglas went on to a successful run in London. From there, it swiftly became a standard part of the theatrical repertoire all round Britain, and even across the Atlantic where it was one of the most popular pieces in early American theatre. Home’s Douglas has not been available in print since Gerald Parker’s hard-to-find 1972 edition. This new edition makes the play readily available in paperback form and publishes it together with an informative and entertaining range of background materials relating to the controversy over the play. This is valuable for anyone wanting to teach the play, but general readers will find this edition worthwhile too. The play itself is a tale of misunderstandings and jealousies revolving around a lost child returned after sixteen years, and has a pleasingly gloomy proto-gothic atmosphere that sets it apart from the sometimes stiff neo-classicism of much eighteenth-century tragedy. But Douglas is also a play of its time and modern readers might find themselves turned off by the rather static plot and expository declamations that it shares with other tragedies of the period. The accompanying background materials, however, add an extra dimension to the play, painting a vivid image of the controversy surrounding it and providing a lively picture of eighteenth-century Scottish society that fascinatingly illustrates the play’s significance in its time. The background materials include essays by the philosopher Adam Ferguson and John Witherspoon debating in scholarly terms the moral worth of theatre. We also find fiery religious denunciations of Douglas, condemning Home’s ‘zeal to promote the interest of Satan’, and calling for the Kirk ‘to break down all play-houses, and banish these idle dogs the actors to the mines, to work hard under severe discipline’. In the mock ballads and lampoons we find Satan himself joining with David Hume to promote the play, while defenders of Douglas mock the Presbytery of Edinburgh as proposing ‘That notorious Drunkards, Idiots, and Villains be the most zealous Christians’ and ‘That every Proposition, which silly people alone maintain, is true’. In presenting these materials together with the play, this edition might be hoped to encourage a wider awareness and appreciation of Douglas and the remarkable place that it occupies in Scottish cultural history. Some aspects of the edition are less than satisfactory though. The text of Douglas itself should have had more careful proof-reading. The editor follows the 1757 Edinburgh edition, and appears to be aiming to make alterations only to obvious typographical errors in the original. However, there are slips: the 1757 opening description of the setting, ‘The court of a castle surrounded with woods’, is altered to end with ‘by woods’ for no obvious reason. The opening stage direction for Act Two in the 1757 text refers to ‘Lady RANDOLPH and ANNA’; the new text alters this to ‘Lady RANDOLPH, ANNA’. A line break is also altered: ‘Whether some foe of Randolph hir’d their swords’ has the next line ‘Or if—’ added at the end, changing the line from ten to twelve syllables (p.19). This is rather jarring in a play with such regular metre as Douglas. McLean’s edition also mostly follows the original text in capitalising all proper nouns, except for in the first twelve pages and again after p.50, when McLean’s text arbitrarily converts all proper nouns to lower case. At one point (p.50) the stage direction ‘Dies‘ is not italicised or set apart from the dialogue, so that it looks like part of the dying Norval’s speech. Slips like these are hardly fatal to the edition, but they are irritating and potentially misleading. The presentation of the background materials is problematic also. These have not been edited but are facsimile reproductions of the original publications, and much of this material has references to contemporary characters and events that will be unfamiliar to most readers and require some explication. For instance, names of people and places were routinely censored in the eighteenth century, so that the facsimile texts presented here have references such as ‘J—n S—l at S—r, and A—m T—n Chaplain to l—d J—n M—’s regiment’ (p.255). Ralph McLean has concise and helpful introductions to the various pieces written about Douglas, and he includes useful short biographies of prominent figures in the controversy. Nonetheless, there are many references that are not explicated in these. It would have been much more user-friendly to provide edited versions of these works, with the censored names given in full and notes included to further explain contemporary references. Another issue is the production quality of the book. Many of the facsimile texts have rather faint print that can be difficult to read. One page of my copy is defaced by a large black smear that obscures much of the text. This edition, then, clearly needs more care in its editing and production. But it nonetheless shows that Douglas is indeed worthy of careful treatment, gathering together materials that bring the play to life and illustrating the energetic debates that sprang up around it. In doing so, it demonstrates that Home’s play deserves a lot more attention that it has received in modern times. 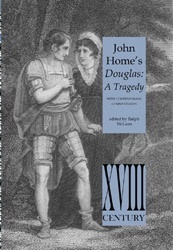 John Home’s Douglas: A Tragedy with Contemporary Commentaries, edited by Ralph Mclean, is published by humming earth. Kevin McGinley is a Lecturer in the School of Language, Translation and Literary Studies at the University of Tampere, Finland.